Easiest Ever Christmas Cookie Decorating Idea—Modern Stamps! / Hey, EEP! Easiest Ever Christmas Cookie Decorating Idea—Modern Stamps! Q: Have you gals made your Christmas cookies yet? I've done a TON of baking for work this week but haven't gotten around to making my own treats at home—whoops! I'm responsible for Christmas Eve cookies, so I need to hightail it this weekend. What have you made so far? 1. Break the cookie dough into pieces on a lightly floured surface. Knead in 1/2 to 3/4 cup flour, a few sprinkles at a time, until smooth. Pat into a disk; wrap and refrigerate until ready to use or immediately roll out to 1/4 inch thick. 2. Cut cookie dough into circles using a round cookie cutter. Arrange on parchment paper–lined baking sheet; freeze 30 minutes. Lightly spray a stamp with cooking spray. 3. Bake cookies as label directs. Remove from the oven and immediately stamp each cookie while they're still warm, spraying the stamp with more cooking spray as needed. Transfer to racks to cool. 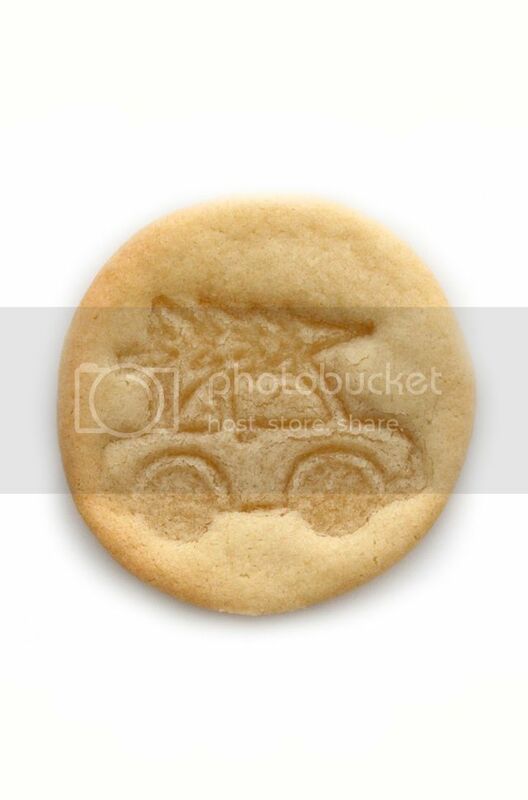 Where can I find this adorable cookie stamp?